Rob Henderson from Minneapolis won the 350-mile running division last night. Piotr Chadovich from Belarus is the second runner to arrive in McGrath. Congratulations to them both! Steve Cannon from Des Moines, Iowa, and Alaskan cyclists Missy Schwarz of Fairbanks and Kimberly Riggs of Anchorage departed the McGrath checkpoint en route to Nome this morning. It appears the three snowmachines reported en route to Nome have passed the leading bikers and have put in a trail to the ghost town of Iditarod, where 10,000 gold miners once lived. The race takes an alternating course each year after Ophir, following a northern route in even years and a southern route in odd years. Many ITI racers find the southern route – which includes the town of Iditarod – interesting because of its historical significance, and I have heard from racers who have done it that it’s especially scenic between Ophir and Shageluk. The 1000-mile race is more an expedition and adventure than a race. Before anyone can enter the 1000-mile race in the ITI, they need to have finished the 350-mile event in a previous year. Since the year 2000, only about 65 human-powered racers have crossed the finish line under the burled arch in Nome. Only seven have been women. The sole remaining skier on the course, Asbjorn Bruun from Norway, is now 18 miles from Nikolai. Last year, we had two skiers finish the 350-mile race. Few skiers enter this race – even fewer finish. It is not hard to understand why. The trail often includes snowless sections of ice and rocks that are difficult to ski. It’s bumpy from snowmobiles and windy through the trees, and there are short, steep sections that are very narrow and icy. And when it is really cold, there is no glide to skis. There is a reason fat bikes dominate this race, always win and set the fastest times: A fat bike has proved to be the fastest mode of transport for human-powered travel on the Iditarod Trail. 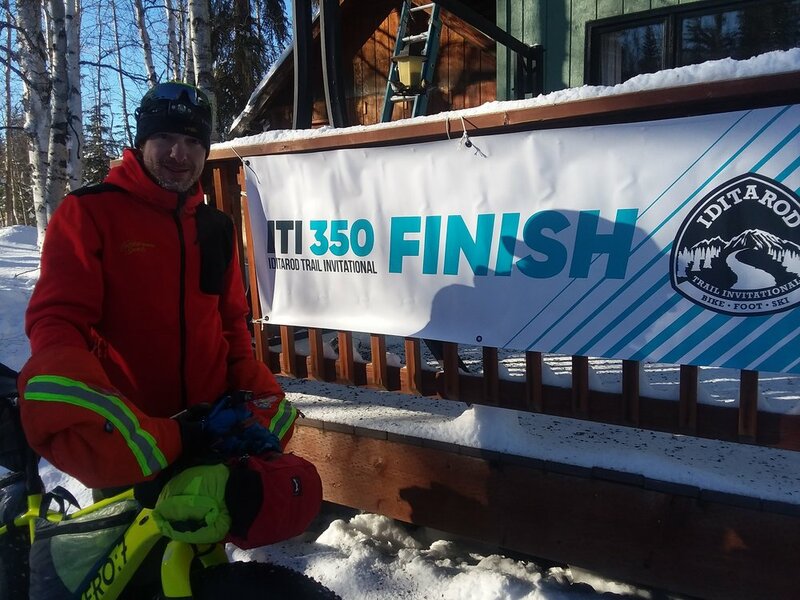 In 2015, John Lackey of Anchorage set an ITI 350 bike record by making it to McGrath in under two days, beating the fastest time of even the dog mushing teams on that stretch of the trail. Jeff Oatley from Fairbanks set the 1000-mile bike record in 2014 of 10 days, 2 hours and 53 minutes. In the early days of the Iditarod, Jeff would have won the dog race with this time. The winning time for champion musher Martin Buser’s dog team in 1992 set a record at just over 10 days, and it wasn’t until Doug Swingley’s win in 1995 that a dog team finished in under 10 days. Women in the ITI are just as tough as any other athlete in the race. This year we have Rebecca Rusch in first place. She has been an endurance racer for more than 20 years and is known as the Queen of Pain. At 50 she wanted to do something that challenged her. She took first place in the women’s division. There were 10 women in the race this year out of 82 participants. It seems like a small number, but it is pretty average. 3 women scratched for different reasons. The women’s field has been small over the years, but the women that attempt the ITI are pretty special. As race organizers and coaches in our training camps we are especially proud of Cheryl Wallace and Nina Pebbles who participated in the camp this year and completed the 150 mile event with shining colors! Only 7 women ( 3 on foot ) and 4 by fat bike have made the 1000 mile journey to Nome since the year 2000. Missy Schwarz and Kimberly Riggs are attempting to go to Nome this year. They are currently in McGrath. They would only be number 8 and 9 making the trip to Nome under human power. 1000 miles on the Iditarod Trail is not only 3 times as far as McGrath but it exponentially more difficult. The 350 mile event is a race, but riding or hiking to Nome is a real adventure and winter expedition that takes a lot of training, experience, knowledge and mental as well as physical strength to accomplish. This side of the mountains is in the rain shadow of the Alaska Range. This means there is often little or no snow. This year there are 12 miles of ice, rocks and dirt. This is fast for the fat bikes, but slowing down the runners dragging a sled. There is a BLM shelter cabin 50 miles from Rohn. Some racers stopped there to rest, sleep and dry gear. It is really remote and desolate country when racers leave Rohn. In past years the race has seen -40 F all the way from Rohn to McGrath. This year the coldest temperatures were in the -25 to -30 F range. Heading into Nikolai there is always a breeze, a stiff wind blowing at your face. Our Nikolai check point volunteers George and Lucas are working hard today and all night to take care of racers and grill burgers for them. Troy Sczurkowski, John Logar, Jose Bermudez and Petr Ineman are on route to Nome. It appears they are pushing their bikes judging by their progress and speed. Until the Iditarod Trail brakers come by, there is no trail on the South Route. No anyone can put it in, it is hard to find your way across there. The ITI does not break trail to Nome only to McGrath. The events are times this way that the 1000 mile racers will have a trail and all the activity that the Iditarod race brings with it. Another bonus for the racers heading to Nome is that they get to see the Iditarod dog sled teams on the trail. Idaho campers (Jay P’s Idaho Island Park fat bike training camp) Graham Muir and George Adams from New Zealand and Brian Broomall roll into McGrath at 6 am this morning all frosty but all smiles. Participating in the ITI annual training camp is another way to enter the race. Camp participants have done extremely well in this race. It is a 5 day camp on the Iditarod Trail where participants learn the skills and knowledge necessary to safely navigate the route. They learn about layering, use of stoves, proper tire pressure, winter bike maintainance and how to eat and fuel our bodies in the cold. As race directors and race veterans teach those skills at the camps and share their knowledge from many years on the Iditarod Trail. They saw Northern Lights last night and had good trails to ride. There is much activity in the Schneiderheinze’s with racers arriving, eating breakfast and enjoying the famous mancakes and 3 egg omelettes. Rookie Rob Henderson is the leading runner in the 350 mile race. He is 41 miles from McGrath. Beat Jegerlehner is the leading runner in the 1000 mile distance. Troy Szcurkowski appears to be pushing his bike on the Southern Route beyond Ophir. There is no trail at this time until the Iditarod trail breakers come through braking trail ahead of the dogs. The ITI always follows the same route as the Iditarod Sled Dog Race. The Iditarod starts on Sunday out of Willow. The trail breakers are usually 24 hours ahead of the first musher. Mushers will start arriving in the community of McGrath Tuesday night. This is my 17th year with the event as RD, competitor or checker and I am impressed with the quality of people that sign up for this event in their human qualities as well as athletic abilities. Today is day 4 of the event reporting from the finish line in McGrath. 12 racers have finished the 350 mile race in McGrath, among them 2 women. 13 athletes finish the new 150 mile distance at Rainy Pass Lodge. There are many more athletes on the trail, runners, 2 skiers. The reasons why people scratch or get frostbite are numerous. Maybe the wrong gear, not using the gear or additional clothing at the right time, not adjusting layers accordingly or stepping into water or overflow and not knowing how to deal with it. In 2017 it was the wind. The wind changes everything on the Iditarod Trail. It pushes the wind chill down to much colder temperatures where frostbite becomes more likely, Dehydration is a contributing factor with frostbite. Stepping into overflow. For those not from Alaska overflow is water on top of ice. The water comes to the surface after heavy snowfalls. It can even be under the snow and not visible. There are also injuries from falls off the bike and overuse injuries for runners like shin splints. Another reason to scratch is when people’s head is not in it. Their mind is not free enough to do it. There is a lot of mental preparation going into this event. Getting wet feet or falling into a river or overflow at -25 F is a dangerous situation. And it has happened to racers. What they do next after an event where they get wet in these extreme temperatures might decide whether they freeze toes or slip into hypothermia. Some people travel to Alaska from Europe or from other states and they catch a cold on the plane which then turns into bronchitis and other pulmonary issues breathing cold and dry air for hours and days on end. The day started at -10 F, Rebecca Rusch was the first woman to finish. Janice Tower a local cyclist and cycling coach from Anchorage and her brother Matt finish in McGrath this afternoon. No runner has finished yet. David Johnson’s 4 days and 1 hour record is safe. It will be hard to get event close to that time. That’s 82 miles per day on foot. Rob Henderson is leading the running division. He is a rookie in the ITI, but has two finished in the top 5 in the Arrowhead and a win in the Rovaniemi 300 in Finland, both ITI qualifiers. He is from Minneapolis. We have two skiers in the event. Veteran and Anchorage local Lars Danner and Norwegian skier in the lead Asbjorn Bruun. The weather forecast for the week is more of the same, no wind, 20’s in the daytime, below zero at night. The Rohn and Nikolai check points are busy with racers passing through. A shout out to all the volunteers, lodges, check points, Trail brakers,participants and sponsors that make this event happen! Rebecca Rusch rides into the McGrath this morning under blue skies and sun this morning at 10:55 am just in time for the famous Mancakes at the Schneiderheinze residence. She is the first women to arrive in the 350 in the 2019 ITI. 3 days 20 hours 55 minutes. Temperature was -10 F here this morning. Congratulations to all the 150 mile finishers. It was a new distance we added this year from the 130 mile finish the last two years. Very proud of all the ITI camp participants that had participated in this year’s training camp on Flathorn Lake mid February and started the 150 mile 9 days later. Congratulations Nina and Cheryl!! 2 days and 21 hours! Congrats to Maren Bradley for winning the running division in the 150 mile!! 2 days 23 hours 6 minutes. Maren is from the Yukon Canada and recently turned from mushing dogs to ultra running. Her goal is to go human powered on her own feet to Nome in a few years. Go Maren! Stephan and Manfred from Germany also participated in this year’s camp and finished in 3 days. Congratulations to all the 350 and 150 mile finishers so far! 350 mile Foot Division: Leading runner is rookie Ron Henderson at the 200 mile Rohn check point.In second place is Piotr Chadovich a rookie in the ITI as well. 350 mile Ski Division: Leading skier ( one of 2) is Asbjorn Skjoth Bruun from Norway. 350 first woman Rebecca Rush is almost in Nikolai, the last check point before the finish of the 300. Leader in the 1000 mile race is 3 time finisher Toy Sczurkowski from Australia. 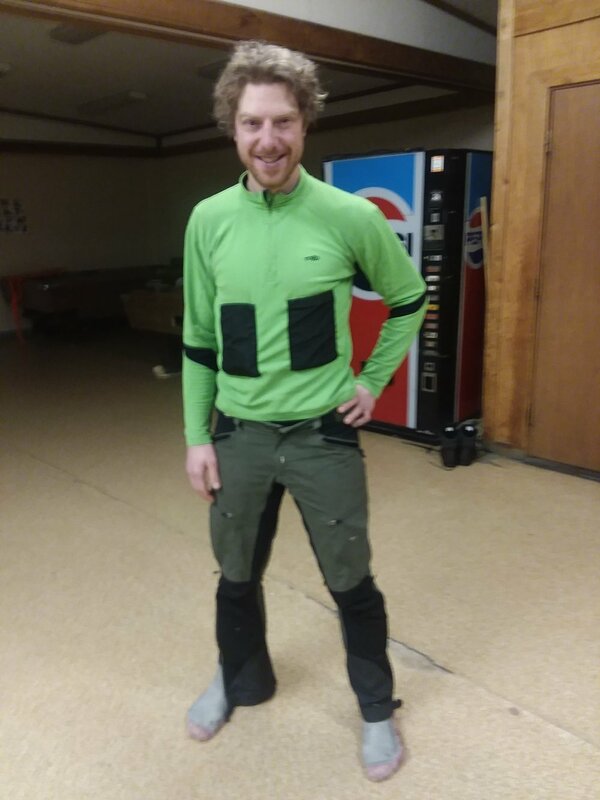 Scratches: Trail legend Tim Hewitt with 11 finishes in the 1000 mile race to Nome and featured athlete in the new film in film festivals that premiered recently in Anchorage and Vancouver has scratched in Puntilla/Rainy Pass Lodge due to knee issues. His tracker showed him going 113 mph on the airplane back to Anchorage. Sean Brown left Winterlake Lodge at 10 am this morning. His track needs new batteries or is not facing the sky. The next check point will alert him of the tracker mulfunction. There are so many amazing people with amazing stories out there. Today we had more people covering the event and family members arrive in McGrath on a flight. There are no roads to McGrath, only air planes or a winter trail that comes alive this time of the year. More riders are arriving tonight, expecting Jim Vreeland anytime now, Adam Erritzoe and Chris Lowry a rookie in the ITI. On route to Nikolai are brother and sister Janice Tower and Matt Tanaka. Janice has done the race twice before and for Matt it is his first time. Some of the fans and family members might be surprised to hear that some of the racers are in the 50’s or even 60’s doing this extreme event. Extreme because of the cold temperatures, remoteness of the trail, extreme weather with wind and drifted in trails. People can excel in ultra endurance events at that age. Experience and knowledge can take them many miles and beyond many obstacles. They are all amazing no matter their age or how many times they have been here. They come for all over the world, there are 20 different nationalities represented this year. 4 bikers are at the finish line in McGrath and 4 riders have finished the 150 mile race at Rainy Pass Lodge (Puntilla Lake). Conditions yesterday and this morning are firm and fast with sunny skies and temps in the high 20s. The temperature at Puntilla was -8F when Kim and Missy rolled out this morning under an aurora-lit sky. Our this years rookies and training camp participants in the 150 mile race are all doing well. In mid February 8 participants from 5 different countries took part in our annual 5 day winter training camp on Flathorn Lake: Brian Marang finished, Nina Stupples, Cheryl Wallace. It appears that some of them bivvied last night on their way to the finish line in Puntilla. They are all doing really well on the trail. The camps is another way to enter the race for new people without a lot of winter and cold weather experience. ITI offers this camp every year. Leading woman is Rebecca Rusch. She is on route to Nikolai. It appears she has been stopping along the way. Currently she has been stopped for 2 hours. Racers bivi in this race. This means they are getting off the trail and getting their sleeping bag out and getting a few hours of rest alongside the trail. The tracker color goes to a faded lighter color. This means they have been stopped for more than 30 minutes. Leading runner is Maren Bradley, she is a runner, she is just a mile ahead of Cheryl Wallace and Nina Stupples from New Zealand. They both did this year’s ITI training camp on Flathorn Lake. German runners Stephan Huss and Manfred Krause, also camp participants this year are doing well. Troy Szcurkowski from Australia is leading in the 1000 mile distance. Leading runner is rookie runner Rob Henderson (mile 161). He is on his way to Rohn and heading over Rainy Pass. The next runner behind him is at mile 136 is Jeff Rock, also a rookie. Foot record holder David Johnson from Willow Alaska who hold the running record of over just 4 days is not competing this year. This year the lead bikers report great conditions of the pass with ridable trails which does not happen very often since the terrain is above treeline and often windblown with drifted in trails. It is a crux point of the course. In past years racers have turned around on the pass and come back to the Puntilla check point due to cold strong winds and drifted in non existent trails. This year mother nature seems to be smiling on the racers. Race veterans Jay Petervary (11 finishes) and Peter Basinger (16 finishes) report some of the best trail conditions in year, rideable trails, no wind and fairly mild temperatures. co race director in McGrath 2/27 9 AM. We have a new champion in the 350 mile champion in McGrath. He wins the 350 mile ITI in 1 days 23 hours 54 minutes. Tyson is from Fairbanks and this is his second year in the ITI. He was second to Tim Berntson in 2016. Rebecca Rush is the leading woman and she has arrived at the 200 mile Rohn check point. Most of the field is now between Skwentna and Rohn. Local skier Lars Danner is the Red Lantern on the trail. The temperature is 12 degrees here in McGrath, blue skies and sunny. I had a great flight on Alaska Air Transit on the mail plane today from Nikolai. It is just a little hop between these two communities. These towns and villages are not road accessible for those not from Alaska following this event. Once a year they are connected by a thin white line in the snow, the Iditarod Trail during the Iron Dog, ITI and Iditarod Sled Dog Race. All the supplies, food, mail, volunteers and even tax accountants come in on airplanes. There is no highway or road system out here in the bush of Alaska. It takes people and all the different events doing their part putting in a trail. Putting in a trail here means not just driving a snowmobile. Sometimes cutting trees, shoveling sidehills and building ice bridges in the fast flowing Dalzell Creek in the Dalzell Gorge is neccessary to get to the Tatina which then takes racers into the remote Rohn check point. There is a small BLM cabin, population zero. We fly in a wall tent, wood stove and drop bags a week before the start. Our Rohn crew serve brats to the hungry racers. On the first part of the race course there are several lodges catering to trail travelllers whether they are on a snowmobile, fat bike , ski, on foot, dog team or come in by airplane. Longtime host Peter Schneiderheize told us it was -20 last night here which is typical for this time of the year. We have seen -40 in many years past. The 4 fat bikers report good trails, despite a lot of snow on the trail this year, we heard rumors of lots of overflow due to the recent snowfall. But the riders into Nikolai so far report none. Nobody expected such a fast pace, close to the 2015 record year. The racers also report no wind drifted trails either. Warm temps, followed by snowmobile traffic, followed by cold temperatures at night, set the trails up once again for a fast ride in the 350 mile race. What was different about the year 2015 when John Lackey set the 1 day 18 hours record was that there was no snow on many sections of the trail compared to this year. The forecast calls for fairly mild conditions, partly cloudy skies and lows in 5-10 F at night. Daytime temperatures are much warmer, days are getting longer by 10 minutes every day in February. Soon it will be spring and the Iditarod Trail will melt out and disappear until it is created new the following year. I had a beautiful flight over to McGrath today. We are waiting for 3 more bikers today, all ITI veterans, Jay P, Clinton and Peter B. The bulk of the racers is now between Skwentna Roadhouse mile 90 and McGrath spread out over 300 miles of trail. 18 F , partly sunny, no wind. Rainy Pass Lodge on Puntilla Lake mile 150 reports 3 F and no wind, clear skies. The temperature dropped to -25 F on the Yentna River last night and at least 4 people have frostbitten face, fingers and toes. David Barker Milner, Thomas Keene,Teri Buck, Tony Newton, John Berryman, Tobias Bos, Ronnie Carrara, Bartosz Skowronski. Thomas Keene walked back to Knik Lake. David Barker Milner got a ride back to Anchorage. We have corrected the tracker mulfunctions Dennis Staley and Tyson Flaharty who is now in the lead and on his way to the Rohn check point, over the Alaska Range (Rainy Pass). Race leader Tyson is in Rohn mile 200. His chasers are Jay Petervary 12 miles from Rohn and Clinton Hodges 16 miles from Rohn. Behind is Peter Basinger. Both veterans with many finishes, wins as well as course records. All of them are entered in the largest field and most competitive distance of 350 miles. Leader in the 1000 mile distance is Troy Szurkowski, also a race veteran with 3 finishes in Nome. The first woman is Rebecca Rush is in Fingerlake ( Winterlake Lodge) on a fat bike. Asbjorn Skjoth Bruun is the first skier and he is 72.3. He is a rookie racer. Local skier Lars Danner is at mile 55.6 currently. First on foot is Rob Henderson at mile 85, he is a rookie this year. After arriving in Nikolai with our 2 volunteers Kiwi Lucas Smith ( second year in Nikolai) and George Grigonis from Philadelphia. I was told by locals there is a significant amount of overflow between Nikolai and McGrath up to waist deep in places due to the recent snow and warm temperatures. It is springlike here and way too warm according to the locals. Nikolai is a small athabascan village along the Kuskoskwim River with about 90 people. It is quiet here. There is a church, school, city building, airport, post office and small general store. There some activity here, locals are setting up check points for the mushers race, the Iditarod Trail Sled Dog Race which starts this coming Sunday. Tyson Flaharty is the current leader, 12 miles from the halfway point in less than 24 hours from the start. Anchorage rider Clinton Hodges is only 4 miles behind and Jay Petervary from Idaho is 4 miles back from Clinton. Peter Basinger is in fourth place and had left the Winterlake CP this morning as well. Jay and Peter are longtime competitors in the ITI with wins and records. Clinton Hodges is on his fourth race to McGrath and has placed in the top 3 before, but never won. The 2019 ITI took off yesterday at 2 PM under blue skies. Jay P and Clinton Hodges were in the lead last night into Yentna Station and Skwentna Roadhouse, the second check point. Tyson’s tracker battery was low and it has been replaced. He is tracking now. The tracker made a straight line after replacing the batteries, but he was on track. Dennis Staley’s tracker is also working again. David Barker Milner took a fall and hurt his shoulder. He got a ride back to Anchorage last night from a local biker. Thomas Keene seems to be heading back to Knik Lake as well. We will write an update on him when we find out why. Racers have been making great progress on the Yentna River last night, passing through the first two check points. The temperature was -10 F last night on the Yentna River. Today’s forecast calls for temperatures in the 20’s under sunny blue skies. Co race director Kyle Durand is on the trail and he was leaving the Skwentna check point with our trail photographer. I am heading out to Nikolai today to get the check point set up there with our trail crew and I will be in McGrath at the finish line starting Tuesday. There is only GCI cell phone coverage there, none in Nikolai. My new number in McGrath is (907) 574-0425 for anyone that needs to reach me in case of an emergnecy. The 2019 ITI started today. Congratulations to the following people, who were selected to participate in the 2019 Iditarod Trail Invitational. We look forward to having you join us on the Iditarod Trail in February! We opened lottery applications for the 350 mile and 1000 mile events this month. We will select participants to fill the remaining spots on the 2019 race roster on October 1 which is coming up in just 11 days! The leaves are falling off the trees here in Alaska and it is time to think about winter events, gear set up and training for winter ultras! Our annual Iditarod Trail winter training camp on Flathorn Lake is taking place Monday -Friday February 11-15, 2019 this coming year and open to fat bikers as well as runners this year. There will be two instructors (Kathi Merchant and Kyle Durand) as well as local race veterans offering advice on everything cold weather and endurance related to gear, clothing, training, navigation, fueling on the trail. There is a lot of experience to be shared with camp participants from those those race veterans and race organizers! We are offering a $300 discount ( $1400 instead of $1700) for camp participants signing up for the Alaska training camp and the new halfway race (150 miles) with a finish and meal/overnight at the oldest hunting lodge in Alaska, Rainy Pass Lodge, a stunning location in the Alaska Range just below the famous Rainy Pass! The 2019 roster was posted and is live on the website on September 1. We also are offering a discount of $300 ($1400 instead of $1700) for a package booking the Flathorn ITI training camp (February 11-15.2019) 5 days this year for runners and cyclists and participation in the same year in the 150 mile race with a finish at Rainy Pass Lodge at Puntilla Lake in the Alaska Range. This is a very attractive distance for runners especially. It also will give racers a taste of the mountains with a more challenging terrain including the Happy River Steps and an elevation gain in hilly terrain into the Alaska Range. Rainy Pass Lodge sits at a beautiful stunning location in the mountains and is also the oldest hunting lodge in Alaska. Finishers will enjoy a meals at this lodge before returning by bush plane to Anchorage. There are only 7 more spots left in the 150 mile distance. We have opened registrations online for the new 150 mile race from Knik to Rainy Pass Lodge for the 2019 event. Applicants need to have one 100 mile winter qualifier or other winter expedition or high altitude mountaineering experience to enter this event. The entry fee is $750. Veterans can start applying online today for the 2019 event. Dates: Sunday February 24th 2019 2:00 PM Knik Lake, Alaska.